This is by far my least favorite task to do while working as a self-storage property manager. A customer comes into the office, frantic because they have totally all their keys to their unit’s lock, and further agitated by the fact that they have to get in right now. Not only does this job drag you away from the office but it can involve an obnoxious amount of preparation. If your self storage property doesn’t have a ample power outlets throughout (and many of the older properties do not) then you’re looking at laying out however many extension cords it will take to reach from your main power outlet (usually in the office or just outside it) to the unit the tenant needs to get into (usually as far from the office and single power outlet as possible). Your tenant is frantic and upset. You may have been working on other things. If you decide to cut the disc lock for them right then, you need to lay the cords, find the facemask to guard against the shower of sparks that will fly up, and get your angle grinder prepared. Tenants, if you buy a disc lock to secure your storage unit, do not, I repeat – do not, ever lose your keys to it. Just don’t lose your keys! If you do lose your keys to a disc lock, you can prepare to pay a hefty lock cutting fee. Some property managers will be cool about helping you out with a simple padlock, since these can be snapped off pretty quickly with a pair of decent bolt cutters. Don’t expect the same treatment if the lock you’re insisting they cut this very minute. Expect, instead, to pay the full lock cutting fee, which is usually $25-50. You can also expect to get hit up for a new lock before leaving the property, since most managers will insist that your unit is locked at all times. If you’re the lucky property manager that gets to cut your frantic tenant’s disc lock, here are a couple of important tips you need to keep in mind to minimize your grinding time and any possibility of injury to yourself or others. 1. Always wear face protection. Of course you’re in a hurry to get your tenant into their locker so you can get them out of your hair. Wear a proper face mask anyway. If you don’t have one available, don’t cut the lock. If the tenant becomes problematic at this point, explain to them that although you are sorry for their error, by which they effectively locked themselves out of their own unit, you cannot perform the courtesy of cutting their lock for them without proper face and eye protection. The risk of getting a white-hot sliver of metal in your tender little eyeball simply isn’t worth the risk, especially to please a tenant that can’t even keep it together enough to hold onto their keys. You can be pretty comfortable with your extension cords going over surfaces that you know people will need to drive over, especially if you’re using the heavy duty extension cords. What you need to be slightly more concerned about is who is around that could be tripping on them. 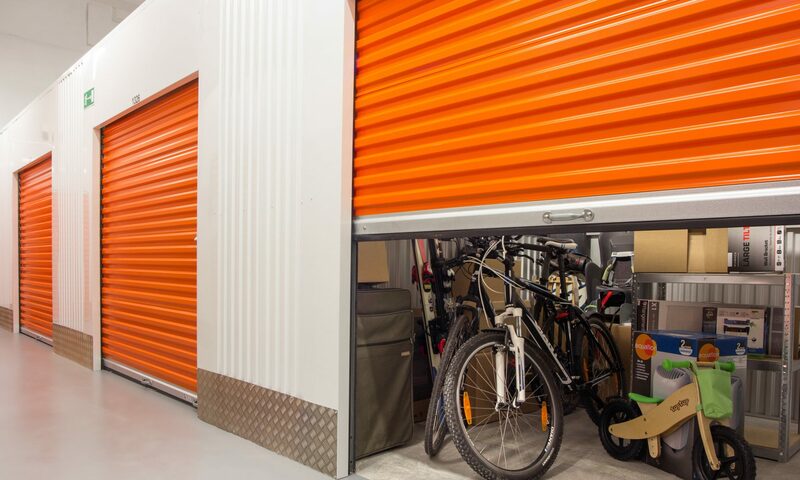 If, for example, you have some current tenants using their drive-up unit and moving heavy boxes to and from their vehicle, they might not notice if you hastily lay some cable and then scamper off inside to grind down a disc lock. Imagine their surprise when they are struggling with a heavy box they can hardly see over just to be lassoed by a thoughtless loop of cord you left on the ground near their unit. This could very well be your fault and become a liability issue. If you do have to put down extension cords when you have tenants on the property, make an effort to pop over and let everyone in the area know that you need to put down cords so they should watch their feet. Also explain that you will be grinding down a lock and you might not be able to hear them, and remind them to please keep their distance from where you’re working because there will be live sparks. Communication is key to keeping an area safe and making sure that your tenants, who could be tired or drunk or only focusing on finalizing their tedious move, know to steer clear of the cords and the sparks. Once you get the hang of this, you can simply look at the lock and start grinding at the weakest point. Basically, there is one spot on the right side of the lock when you face it such that the keyhole is toward you. As you can see, exploiting the weakest point of the disc lock requires an angled cut. This is the point at which the curved bolt actually touches nothing inside, a brief point of non-contact. If you can grind through this sweet spot, you essentially have only the thinner outer sheath of the lock to make it through before the lock will be completely compromised and will drop down to the floor. Remember that the lock will be hot after several minutes of grinding, hot enough to burn you to the touch! I usually let the lock sit on the ground if it has cleanly split and fallen to the floor after I make it through with the angle grinder. If you’ve pretty much beat the lock with the angle grinder but it’s still clinging on, you can usually seal the deal by giving it a strong straight kick with the sole of your shoe.